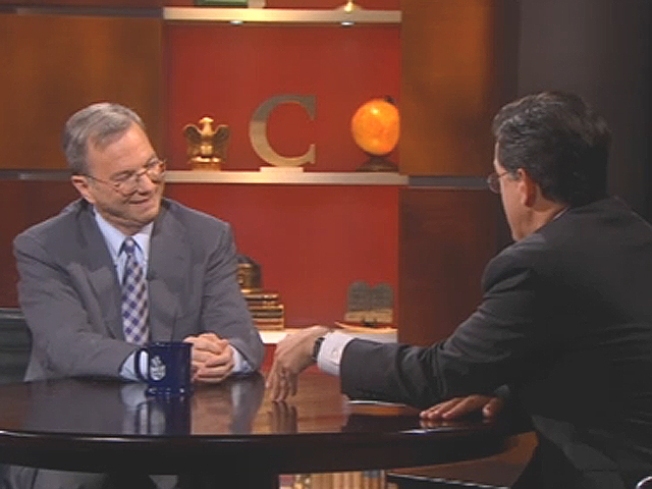 Google CEO Eric Schmidt on with Colbert. The CEO whose mantra is "do no evil" has an ominous reminder for everyone and he took to the "Colbert Report" to deliver it. Google leader Eric Schmidt went on with one of the web's trendiest celebrities, according to Google, to warn the digital generation to be careful of what they post on online. "The serious goal (is) just remember when you post something, computers remember forever," Schmidt told Colbert. "And if it's really juicy there will be copies everywhere." As for his company's role in the remembering process? "Google just collects it," he swore adding that it soon "forgets" user search history because most countries require it. In a five and a half minute interview, Schmidt explained how Google's algorithm works, why the company pulled out of China and recent comments the CEO made suggesting young Internet users will soon have to start changing their names to escape the skeletons hiding in their virtual closet. "It was a joke," he said. "It just wasn't very good." But it was good enough to strike fear in the heart of the man who dreams of keeping fear alive. "Could you help me clear my browser history?" Colbert asked. "I would encourage it," Schmidt responded. That was all Colbert needed to prove that Google is not as virtuous as it claims. "You have been checking my searches," the host said.